You’ve been with me for a year, and we sure have traveled serious distances together. I’ve brought you to multiple Malaysia trips. We’ve even went on a tour to Thailand, Myanmar, Laos and Cambodia. We went through thick and thin together – through good weather, and some really bad ones; on good roads, and some horrible ones. I will always cherish the times we spent on these trips. But now, it’s time for me to bid you goodbye…. … to my reflective P-plate! Yeah! sgBikerBoy is now graduated and officially an “experienced rider”. Hahah! You see, here in Singapore, after completing the initial motorcycle riding course and obtaining a riding license, we’d qualify for a Class 2B (below 200cc) license. 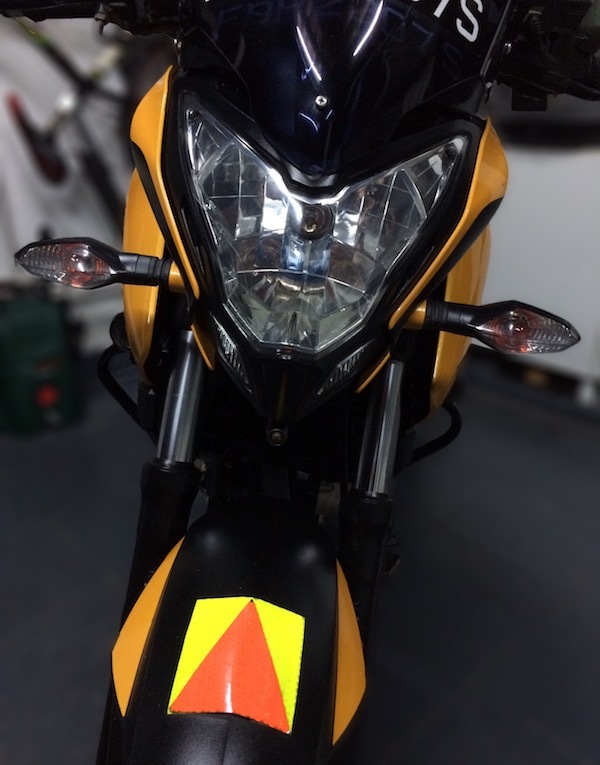 We then have to display the orange-yellow reflective sticker on the bike for at least a year – just to warn other road users that I’m a “new rider”. So completing this one year means I’m now legally allowed to remove that “newbie badge” from my motorcycle. Time for the next level? Hahah… Nevertheless, I always practice riding on the road in such a manner “as if everyone is out to kill me” – a valuable advice I received from a friend when I was taking my 2B lessons. Not to breed complacency but I had the different kinda experience. I tot there were those who actually went to make things difficult for the newbies. Once the P plate remove ppl seem to jam brake less in front of me, especially filtering to main road/expressway. Well, I think it’s inevitable that you’d get to meet all sorts of drivers on the road – irrespective of the p-plate status. And with the seeming trend of driving against the flow of traffic these days, I’m now extra wary on the roads. Put it back on then! There’s no rule against keeping the p-plate on even after probation. Maybe you’d need 2 sets on a 2A bike, and 3 sets on a CL2 bike. Lol! The plan next is to get my CL2A license. Are you getting another 2B bike or you gonna go bikeless until you get your 2A? Huh? I don’t quite understand… I’m still riding my Pulsar for now… I was saying goodbye to my P-plate – not my Pulsar! Lol! Doh! Good one. The title, together with the query on the 400x you put on Facebook, made me think you getting rid of your bike! Haha. Previous Previous post: Happy New Year 2017! ← Happy New Year 2017! ← Passed my Class 2A License Test!